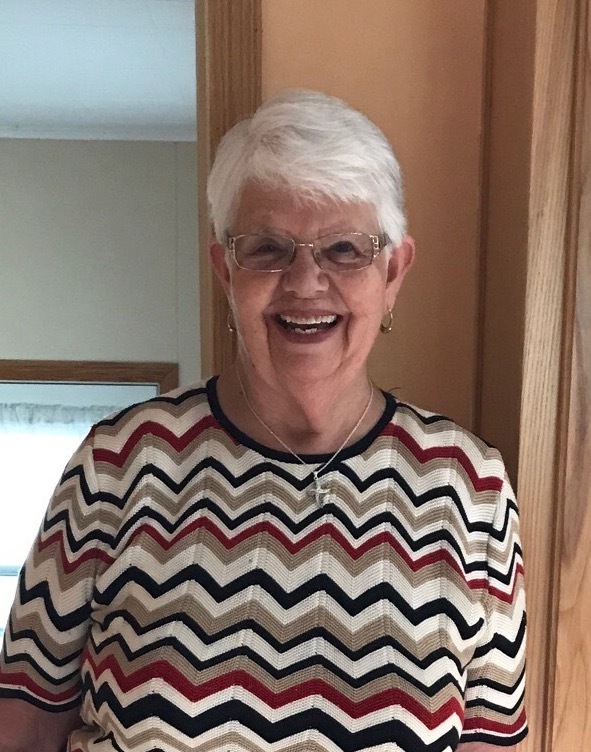 Donna Mae Wilfong, age 80, of Escanaba, passed away early Tuesday morning, January 15, 2019, at Lakeview Memory Care Facility, in Gladstone, where she currently resided. Donna was born March 11, 1938, in Escanaba, the daughter of Leonard and Beatrice (DeMars) Bryson. She was raised in Escanaba and was a 1956 graduate of Holy Name High School. On August 29, 1959, Donna was united in marriage to Thomas Wilfong at St. Anne Church in Escanaba. Together the couple lived in various locations where they raised their family and made many lifelong friends throughout the years. Donna was employed as a telephone operator for Michigan Bell Telephone Company. She is remembered for her great laugh and love of entertaining. She was a devoted wife of 59 years and a wonderful mother. Donna was a member of St. Thomas Church in Escanaba where she served on the St. Thomas Church Circle, the Alter Guild and was a member of the Blue Army. In years past, Donna enjoyed spending summers at their cabin among family and friends. She will be deeply missed. Also surviving are Donna’s 13 grandchildren, 5 great grandchildren and numerous nieces, nephews and cousins. She was preceded in death by her parents, Leonard Bryson and Beatrice Plouff. Donna’s family will receive friends on Thursday, from 2:00PM to 4:00PM, at the Skradski Family Funeral Home in Escanaba. Mass of Christian Burial will follow visiting hours, at 5:00PM on Thursday, at St. Thomas Church in Escanaba, with Rev. Fr. Rick Courier officiating. Luncheon will follow in the St. Thomas Parish Hall. Donna will be laid to rest in the Holy Cross Cemetery in the spring. The Skradski Family Funeral Homes of Delta County are assisting with arrangements. Heaven gained another angel yesterday. I’m so sorry about Donna’s passing. She was a truly wonderful woman and friend. I’m really going to miss her wonderful laugh and her friendship. I loved her like my second mom. Godspeed Donna Mae, godspeed. Sorry for your loss Wilfong family. My thoughts and prayers are with you today and the days to come. May you find peace and comfort in the good memories. Deepest sympathy. Donna was a very nice lady. Thinking of you Tom and the entire family…Donna was such a special person. She had the ability to brighten up a room with her presence. Her ready smile and genuine friendship was something we always appreciated. May GOD give you comfort in the knowledge that someday all will be together, never to be separated again!